The Practitioner's Guide to Governance as Leadership offers a resource that shows how to achieve excellence and peak performance in the boardroom by putting into practice the groundbreaking model that was introduced in the book, Governance as Leadership. This proven model of effective governance explores how to attain proficiency in three governance modes or mindsets: fiduciary, strategic, and generative. 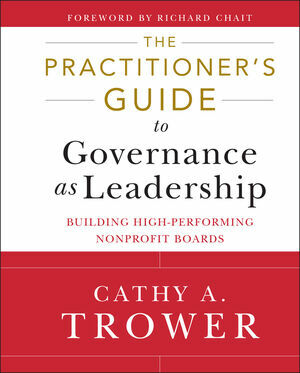 Throughout the book, author Cathy Trower offers an understanding of the Governance as Leadership model through a wealth of illustrative examples of high-performing nonprofit boards. She explores the challenges of implementing governance as leadership and suggests ideas for getting started and overcoming barriers to progress. In addition, Trower provides practical guidance for optimizing the practices that will improve organizational performance including: flow (high skill and high purpose), discernment, deliberation, divergent thinking, insight, meaningfulness, consequence to the organization, and integrity. In short, the book is a combination of sophisticated thinking, instructive vignettes, illustrative documents, and practical recommendations. The book includes concrete strategies that can help improve critical thinking in the boardroom, a board's overall performance as a team, as well as information for creating a strong governance culture and understanding what is required of an effective CEO and a chairperson. To determine a board's fitness and help the members move forward, the book contains three types of assessments: board members evaluate each other; individual board member assessments; and an overall team assessment. This practitioner's guide is written for nonprofit board members, chief executives, senior staff members, and anyone who wants to reflect on governance, discern how to govern better, and achieve higher performance in the process. CATHY A. TROWER, PhD, is president of Trower & Trower, Inc., a board governance consulting firm founded in 1998. Formerly a senior research associate at Harvard University's Graduate School of Education, Cathy is nationally known for her expertise on board policies and best practices, leadership, organizational change, strategic thinking, group dynamics, faculty diversity/workplace satisfaction, and shared governance. She is in high demand as a speaker, consultant, coach, and advisor to boards and executives.